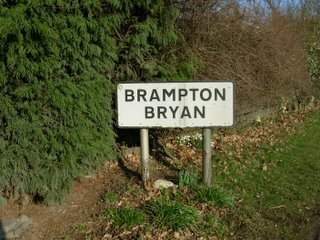 This is the village of Brampton Bryan in Herefordshire. We always drive through this village on our trips back to England. We prefer to take the pretty route rather than the motorway, even though it takes a little longer, it adds to our pleasure, for the Herefordshire countryside is such a delight at any time of year. This is a fruit growing/cider making County. The fruit orchards stretch for miles, of course at this time of year, the trees are quire bare, well no, not quite bare, for they are adorned with magnificent bunches of mistletoe, hanging from the branches, just like Christmas decorations. 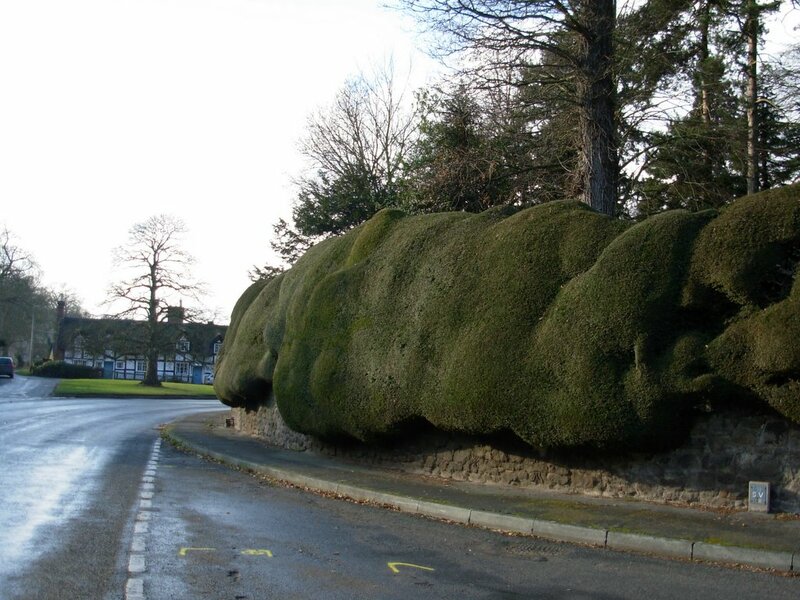 The churchyard in Brampton Bryan is surrounded by this amazing yew hedge. In ancient times, the wood from the yew was used for archery bows. Yew is a slow growing evergreen and we’ve observed that it is cut just once a year. It has such a wonderful shape too, it drapes itself over the top of the wall in such a comfortable fasion. It reminds me of a line of elephants walking in line with lovely rounded bumpy bottoms. How fascinating! I love your pictures. Herefordshire was one of our favourite counties. It was mid-summer when we drove through and everything was so lush. Loving your photos - they make me cry "I want to go baaaack!" Hopefully, one day!!! Marion - I just read on Kerri's blog (comments) about your pinched nerve and sore shoulder. I hope it's feeling better by now. 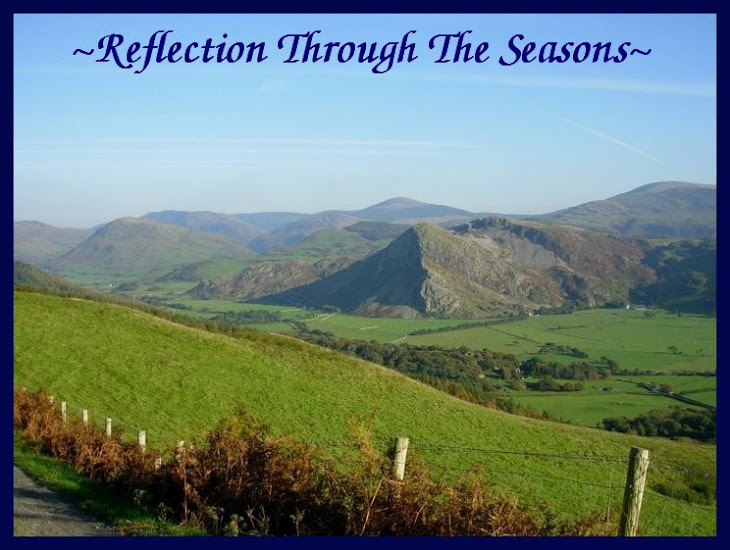 Was it too much turning your head to look at that beautiful English scenery? Couldn't blame you. I hope you are 100% recovered very soon. Cheers. What beautiful pictures you take...the description of the yew is amazing...and very true!! And the "Irish Coffee" cup you asked me about...I will use it at times as well as display it, and actually used it the morning for my coffee! You are so forunate to live in such a beautiful country, how I long to visit!! Enjoy dear..hugs to you! Hi Marion, thanks for giving us this glimpse of your beautiful scenery. I love to see your part of the world. I'll never be able to in person, so this is just perfect and a delight to boot! And, thanks for the lovely comment you left me at knitting kat. Aren't comments great! In reading your other comments, I want to add my good wishs for a speedy and thorough recovery from that pinched nerve. I know they can be torture. Have a nice day! 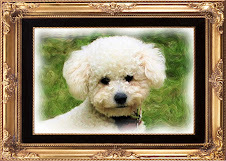 Marion, I love the pictures and had to call my husband to see them. 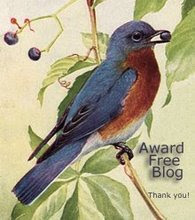 This is what is so neat about the blogs we have, we can see so many different countries and see so much, we would have missed if it were not for all the sharing we do through our post. Thanks so much for taking me along on your ride. Hope you feel better soon. Yes, worlwide blogging is something unique, just like you are on the road all the time. The yew hedge is something I cant understand. Haven't ever seen something like that. Really wonderful! I also hope you're feeling better Marion! This is yew? Can't believe it! It looks crazy, amazing, but crazy! Now I know what it looks like ...a green moss! Hello Everyone.... thanks you for your comments, pleased you liked the yew hedge. I hadn't realised it would be such a surprise to some of you. Nice to hear the you've visited Herefordshire Alice. You are so right Sharon, blogging is a great way in enabling us to glimpse into each other's part of the world. its improving my geography too! I like to check out where you are all located. You are right Maria, the hedge does look like huge mounds of moss. Hi Marion, nice pictures. 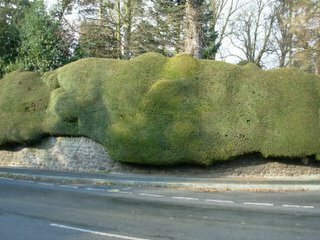 I also stopped and took heaps of photos of this amazing hedge. A local old boy told me how the crazy shape came to be. The hedge was cut on a regular basis up until the war (cant remember if it was first or second). 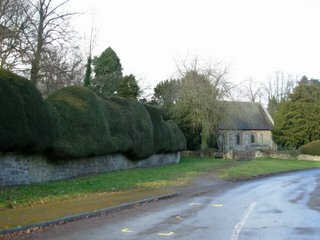 Once the war broke out, the people who cut this huge hedge were now in the army or otherwise enganged in more important tasks. So the hedge grew and developed in own unique and natural shape. All the best Pat McD from Coventry. How lovely, I like the herd of elephants with the bumpy bottoms, my husband did too. I so much enjoy your photos of your travels and wish I may also one day get to visit England. I live in a small Welsh village which is situated in the southern tip of the Snowdonia National Park. Its an area of true outstanding natural beauty. We have the Cambrian mountains to the east of us and the coast of Cardigan Bay out to the west. My husband and I moved to Wales from The Cotswolds in England 19 years ago. We bought the old village Police Station, which we have worked tirelessly renovating ever since. You could say its a real labour of love. I have retired after working many years in the travel business, this now leaves me free to pursue the many things in life that I enjoy.